The next main signal is advance signaled by a separate distant signal (i.e. not by this main signal). 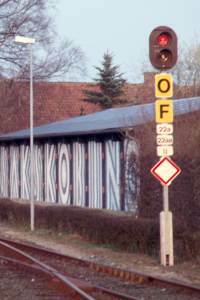 Until 1998 the sign was only used on lines with mixed advance signaling, i.e. some main signals were advance signaled by a separate distant signal, and some by the preceding main signal. Expect an automatic level crossing within braking distance of this point. Prepare to stop before the level crossing if the level crossing signal (visible from this point) does not indicate that the level crossing is closed. Expect an automatic level crossing beyond the main signal, the level crossing being closed when the signal displays "proceed" (or better). 1978- : no. 17.1.1, 17.1.3 and 17.1.5. Expect a main signal at the distance indicated. Approach markers are used only for entry, block and protection signals, i.e. not for main signals in station areas. Since 1998, approach markers of entry signals are gradually being replaced by no. 17.1.2, 17.1.4 and 17.1.6. 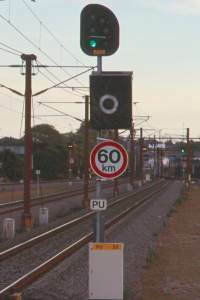 The 1200 m and 800 m signs may be omitted as necessary if main signals are densely spaced. On private secondary lines with max. speed 80 km/h (50 mph), approach markers may be omitted entirely if the main signal is clearly visible. 1978- : no. 17.1.2, 17.1.4 and 17.1.6. 1978-1998: Expect a main signal at the distance indicated. 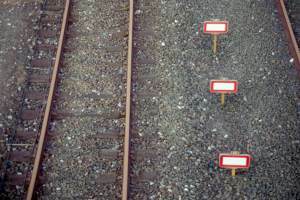 The signs apply to both tracks of a double-track line. 1998- : Expect an entry signal at the distance indicated. The signs may apply to both tracks of a double-track line. The 1200 m and 800 m signs may be omitted as necessary if main signals are densely spaced. 1978- : no. 17.2.1, 17.2.3 and 17.2.5. These signs have the same meaning as no. 17.1.1, 17.1.3 and 17.1.5 respectively. 1978- : no. 17.2.2, 17.2.4 and 17.2.6. These signs have the same meaning as no. 17.1.2, 17.1.4 and 17.1.6 respectively. This version is used between parallel tracks as described above. 1975- : no. 17.3 and 17.4. A train passing the sign shall whistle one long warning tone as follows. - At no. 17.3: always. - At no. 17.4: only when visibility is poor, e.g. due to fog or snow. 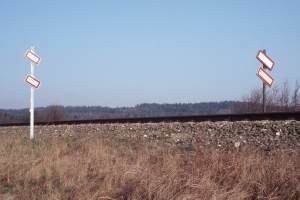 1975-1985: Expect a platform or spur without main signals 500 m (550 yds) beyond this point. 1985- : Expect a platform or spur without main signals 800/1200 m (875/1310 yds) beyond this point. Warning distance 1200 m is used on lines with speed limit above 120 km/h (75 mph). The sign is rarely used on suburban lines. The sign is situated at an entry or protection signal and indicates the name of the location. The sign indicates the beginning of a platform. The sign is only used in connection with no. 17.5, i.e. not in station areas and rarely on suburban lines. On secondary freight lines, the sign may also be used to indicate a level crossing that has to be operated manually by the train crew. For this purpose the sign is situated 400 m (440 yds) in advance of the level crossing. Electric heating must be switched off when passing the sign, because of risk of interference with track circuits. The sign is usually placed near an exit signal. Electric heating can be swhitched on again when entering a line where electric heating is permitted. This is not indicated by a sign. 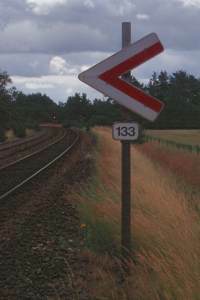 The sign indicates the distance in km along the line (thus the sign above reads: 129.8 km). The signs face both directions and are usually spaced 200 m (220 yds) apart. This sign is gradually replacing concrete "milestones". Switching operations within the station area may not go beyond this point. - if the station limit of a wrong main track can not be recognized by the position of the ordinary entry signal, e.g. because the 2 tracks are widely separated. The sign may be used as Station Limit sign facing a secondary track without shunting (dwarf) signal. If such a sign marks the limit between station and harbour areas, it faces both directions. 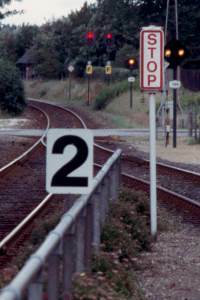 When situated in the middle of the track: All movements must stop at the sign, as it indicates a buffer-stop. The sign indicates where to stop when a specific signal displays "Stop" or eqv. The sign is often used where a number of spurs have a common signal to authorize movements into an interlocked area. The sign indicates the clearance limit for converging tracks. The sign indicates the station limit for tracks leading to an engine facility, repair shop or eqv. The sign indicates the end of a switching route, if the track behind the sign is outside the interlocked area. 1975- : no. 17.18 and 17.19. The sign indicates the exact position to stop at a platform or before a signal. No. 17.18 applies to all trains. No. 17.19 applies to trains consisting of the number of vehicles indicated. No. 17.19 usually presents the number 2, 4, 6, 8, 10, 12 or 14. However, odd numbers are sometimes used instead. 1996- : no. 17.18 and 17.19. These signs indicate the same as no. 17.18 and 17.19 above. This version has an additional track section number to enable the driver to identify the position of the train when exchanging radio messages. It is used on suburban lines with 'HKT' cab signaling system. - 80, 160, 240, 320. 1996- : no. 17.21 and 17.22. These signs indicate the same as no. 17.18 and 17.19 and further have the function of no. 17.24 (explained below). The signs have an additional track section number as described above. They are used on suburban lines with 'HKT' cab signaling system. The sign indicates where to stop if the cab signal indicates "Stop". The sign has an additional track section number as described above. It is used on suburban lines with 'HKT' cab signaling system. This sign acts as a block signal substitute and is placed at 'HKT'-block boundaries along the line. If the "signal" is situated at a platform, no. 17.21 or 17.22 is used instead. If a 'HKT'-block boundary is equipped with a main or dwarf signal, no. 17.21 is used instead. Trains without active cab signal should ignore the sign. 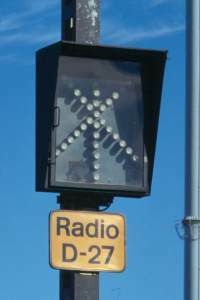 The signal carrying the sign is not in use, and is not illuminated. The speed or route destination indicator carrying the sign is not in use and is not illuminated. The line or station behind the sign is equipped with ATC (full cab signalling). Speed limit for trains without active cab signal is 80 km/h (50 mph) or less. The line or station behind the sign is not equipped with ATC (full cab signalling). 1995- : no. 17.29 and 17.31. 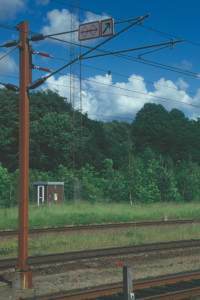 An electric train must stop at the sign, as it indicates the end of the overhead wire. The 2 versions have the same meaning, however, no. 17.29 is gradually being replaced by no. 17.31. 1995- : no. 17.30 and 17.32. An electric train must stop at the sign if a following turnout is set for the direction indicated by the arrow, as this track has no overhead wire. The arrow may point left, right or straight ahead. The 2 versions have the same meaning, however, no. 17.30 is gradually being replaced by no. 17.32. An electric train shall operate the main circuit breaker(s) because of a following boundary between different power supply sections. The operation may be automatic or manual. The main circuit breaker(s) may be reset in order to continue power supply to the train. An electric train shall lower all pantographs when passing the sign. 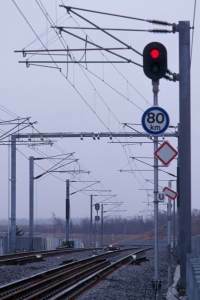 An electric train may raise pantographs when they are behind the sign. An electric train equipped for the power supply indicated may raise pantographs when they are behind the sign. 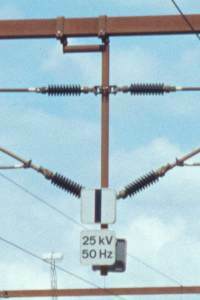 The sign is used in border stations with 2 different power supply systems. 1995- : no. 17.39 and 17.40. Switch radio channel as indicated. No. 17.39 indicates the radio channel for general use; the sign normally applies to trains travelling through the area. No. 17.40 indicates the radio channel for local use; the sign normally applies to trains doing work at a station. The track behind the sign is not suited for vehicles of the type indicated. At the moment, the sign is only used for the suburban train set class "SA". 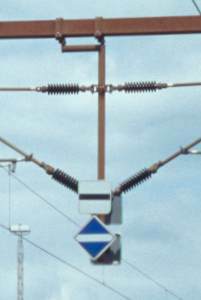 Combined signals (AM/DS and VM/DS) are equipped with 2 signs, the "DS" sign being the lower. 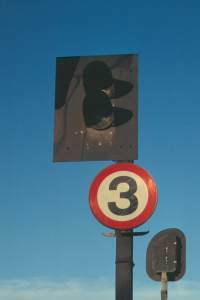 Since 1994, "I", "U", "AM" and "VM" signs often include the signal number. When placed at an entry signal (1975- ) : The sign indicates the permitted speed when the entry signal displays "Proceed at Reduced Speed". The sign should be ignored when the entry signal displays any other "Proceed" aspect. Trains with active cab signal should always ignore the sign. When placed at a platform exit signal or exit block signal (1987- ) : The sign indicates the permitted speed when the signal displays "Proceed" or better. Trains with active cab signal should ignore the sign. The signal carrying the sign is assigned to the track indicated. The sign is used when track assignment might be ambiguous, e.g. because the signal is not situated to the right of the track. 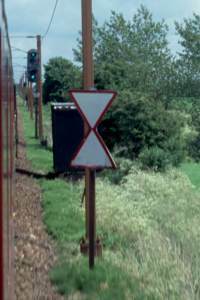 The sign indicates the position of a buffer-stop. The sign is used as necessary. Buffer-stops that may constitute the end of a train route are always equipped with no. 17.12 instead of this sign. The sign indicates the exact position to stop at a platform. A sign with an 'S' applies to all trains. A sign with one or more numbers applies to trains consisting of the number of train units indicated. The sign only applies to "flexliner" trains and has now widely been replaced by no. 17.20. The station has entry routes without overlap; max. speed is 40 km/h (30 mph). If the restriction applies to certain tracks only, the track numbers are indicated as well. The sign is situated at the entry signal. The sign is used by private secondary lines only. Expect a platform or spur without main signal 100 m (110 yds) beyond this point. The sign may also indicate a named point used only for radio authorization of train movements. 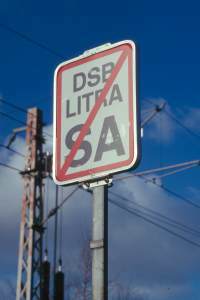 The sign is used by private secondary lines only, and has widely been replaced by no. 17.5. The line section between the signs is susceptible to fire. The sign applies to track maintenance crews and occasional steam engines and is very rare now. Expect an entry signal carrying the blue-rimmed "Reduced Speed" sign at the distance indicated. Trains without active cab signal prepare to reduce speed to 40 km/h (30 mph). The signs were experimental and were replaced by the subsequent version. 1998-1999 : no rulebook number. Expect an entry signal carrying the "Reduced Speed Zone" sign at the distance indicated. Trains without active cab signal prepare to reduce speed to 40 km/h (30 mph). After a trial period, the signs were considered unnecessary. Now, no. 17.1.2, 17.1.4 and 17.1.6 are used instead. The sign indicated the speed limit of the exit route when it was lower than the speed limit of the entry route. The sign was placed near the entry signal, and was considered unnecessary shortly after the introduction of the 1975 rulebook. The sign indicated the length in meters from the sign to the end of the entry route (thus the sign above reads: 1230 m). 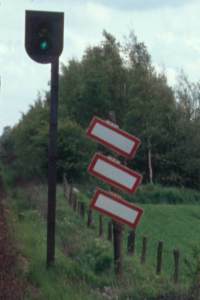 The sign was used for entry routes with overlap < 150 m (165 yds) to assist the precise braking of the train. The signs indicated the permitted speed for trains without active cab signal. Trains with active cab signal should ignore the signs. The signs were experimental and were replaced by the "Reduced Speed Zone" and "End of Reduced Speed Zone" signs, respectively. Expect platform exit signals carrying the "Reduced Speed Zone" sign. Trains without active cab signal prepare to reduce speed to 40 km/h (30 mph). Trains with active cab signal should ignore the sign. The sign was experimental as were platform exit signals with the "Reduced Speed Zone" sign. Speed limit for trains without active cab signal is 40 km/h (30 mph) until otherwise indicated by the "End of Reduced Speed Zone" sign. Trains with active cab signal should ignore the sign. 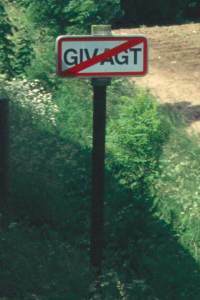 The sign was used at so-called "reduced" entry signals, i.e. signals without any speed indication. The sign was further used at certain platform exit signals without speed indication in 1998 only. 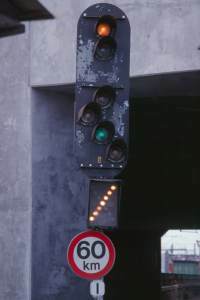 Now, "reduced" entry signals are designated by no. 17.6 in the same manner as ordinary entry signals. Speed limit for trains without active cab signal is 80 km/h (50 mph) or less. Trains with active cab signal should ignore the sign. The sign was used at exit signals following entry signals or platform exit signals carrying the "Reduced Speed Zone" sign.